You'll love this gorgeous ornamental tree for what it does to the landscape! Whether you choose to tuck it into a garden space, grow it as an informal hedge, or plant it en masse, this small yet striking tree is sure to be a seasonal standout. Summertime brings distinctive, billowy hairs from spent flower clusters and create charming plumes of dusky pink and purple that appear to float above rich purple foliage. In autumn, Purple Smoketree's deeply hued foliage takes on gorgeous shades of yellow, orange and purplish-red. It reliably grows 8-12 ft. tall with an 8-10 ft. spread. 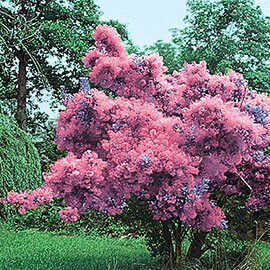 Purple Smoketree tolerates dry conditions and grows best when planted in full sun. Zones 4-8. 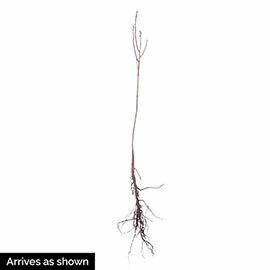 For each offer ordered, get 2-3' bareroot. Depth: Dig a hole large enough to spread the roots without bending them. Plant at the same depth as in the nursery. The previous soil line should be evident. Foliage: Deciduous, purple foliage. In fall, foliage will show shades of yellow, orange, and purplish-red. Soil Requirements: Average, well-drained soil. Does not like to be wet. Good drainage is essential. Pruning: Can be pruned into tree form. In early spring, only prune what is absolutely necessary, to ensure as many blooms as possible.